What I learned creating a weight loss program. I wrote my first wellness book in 2016. I wanted to understand the digital marketing process and had a partner focused on the weight loss arena. I had a suspicion that the same things that were adding weight to us were also causing depression and fatigue. 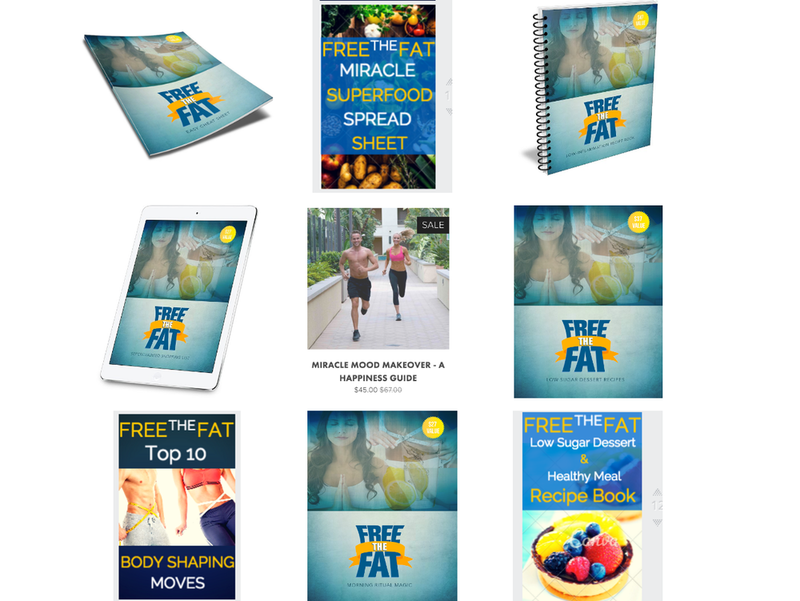 I spent 6 months writing FreetheFat - a stress reducing slimming system. Another 3 months building the website, established a corporation, legally tying to a business partner, hiring a rad spokesperson, shooting a commercial and exercise video... the whole deal. It took most of my focus and I all but ignored this blog. I got talked out of writing the mental health and relationship health books I am passionate about in favor of the weight loss genre. Because time and energy are so valuable, it only makes sense to only go big in areas we really care about. When it gets tough, we stand strong on the hills we're willing to die on. I'm really passionate about how our inner monologue and external relationships affect our perspective and happiness. The weight loss follows faster when we're happy and relaxed. We eat less to fill a hole or avoid a scary task and more to enhance productivity and pleasure. We rest enough living in faith that the important stuff will get done. While researching FreetheFat - a stress reducing slimming system, I learned how important good fats are. Omega3s help with mental health, weight loss, and feeling satisfied. I smear everything with avocado, organic butter, flaxseed oil, or coconut/MCT oil now. I learned weight loss is highly up to our individual genetic makeup but sugar is bad for pretty much all of us. Like really bad. From the stress hormone release to turning on fat storage mode, sugar jacks us up. But fiber helps and sleep is the master reset. Anything that calms and heals get us lean. Anything that spikes cortisol adds to weight gain mode. So I made very little money but learned how to manage the stress of that - including how to not turn toward my favorite vice - sugar. Well, at least without fiber and plenty of water to balance. 3. We can do it! We really do have the tools to do the things we're meant to do on this planet. Anything too good to be true really is just that. My business partner didn't end up knowing how to do most of the things he thought he could - but what a cool experience to show myself I could do/learn/find most myself. All that nutrient research showed that intestine absorption is tricky business and supplement sourcing matters. I couldn't align with those lucrative but suspect supplement providers. After the initial business partner frustration, I connected with a medical grade supplement supplier my doctor friend uses and didn't have to feel morally conflicted in suggesting questionably sourced, profit-focused vitamins. If things had gone as planned, I would have deferred to early advisors and accidentally become another shady vitamin pusher. Talk about losing my mission. The universe kindly led me instead to trusted brands at discount. 4. Count the wins & only the wins. Staying engaged with our journey and proud of our attempts is winning. Staying focused on these wins is essential for a positive mindset and a life we're excited to show up for. I will forever turn to sleep, morning fasting, lymphatic movement, certain herbs, and deep breaths when I want to get bikini ready. I won't attempt to lose weight by spiking my cortisol, destroying my joints, and breaking down my body. Devoting a year to writing a program - even if for only me - is worth what I learned. Finishing something is huge for my perfectionist brain. If nothing ever feels good enough, saying something is done is damn near impossible. But the 1st draft is done!!! I needed to get my first book done so I could get the rest written. I'm proud of creating these and I'm choosing to count the wins. I put together 8 guides, 7 supplement bundles, 1 large book, produced a voice recording, and a website. Peter Diamondis is right about "Fail often and fail forward." (His book Bold is fantastic btw). I can be really hard on myself and 2017 is all about celebrating every win keeping the mind in a state of empowerment and excitement. Another win was the psychological growth. The experience drudged up all sort of old emotional baggage that I needed cleared. I was really disappointed and fighting my brain's cruel attempt at tying this timeline "failure" to all future failures. Old disappointments, false programming, and anxieties needed to see the light so they could be addressed. Super grateful to have new awareness around what those inner sabotaging voices quietly say all day long. No wonder it's tough to get stuff done. Plus, when I got really frustrated, I hopped a plane to South Africa where I read two more fantastic health books, had the trip of my life, climbed Lion's head, and supported a dear friend who is changing the world for women's safety. I would never have been so trigger happy if not so desperately disappointed. The biggest win is the progress on the depression book. I couldn't ignore the correlation between food and pleasurable escape. My mental health focus just had to look at which foods make us sad and how hard it is to give up a sugary pleasure source when we are depressed. So I ended up writing a 56 pager about my actual passion anyway. I grew my compassion for this losing battle. If we can't address our depression, we're going to have a hard time saying no to pleasurable food and drinks. And feeling shame around that is both unfair and damaging. Happiness is a wheel with many spokes on it. Some of it we have control over and some of it is the genetic cortical lottery. But outside of brain chemicals and basic needs being met, there are fun little nuanced cosmic pieces to finding our blend of happiness. Honoring our preferences and the individual things that make us unique help us uncover our purpose, identity, and sources of joy . Culture, gender, spirituality, genetics, birth order, birth signs, and lifestyle can all add pieces to the puzzle. I had a blast peering into the Myers Briggs insights on personality type. Find yours with this test and see if the graph and link below offer insight to your strengths and ideal careers. Take what serves you and leave the rest. 1. I am the all you can eat buffet mosquitos have been waiting their whole lives for. Trinidad, Alaska, Mexico... getting 30 per leg is the average welt count I come home with. I can't shake the little buggers. 2. Even in paradise, I can find a way to NOT relax. Who stresses out they can't do everything in 2 days??? Lie down on the sand Sara & do not move unless otherwise instructed - You're on activity time out.